Samsung gets a lot of stick for what's perceived as bloatware on its devices, even if that situation has improved somewhat in recent years. With that, it's easy to forget that the Korean company does actually produce some really useful software, as evidenced by a new app that's aimed at mobile gamers. 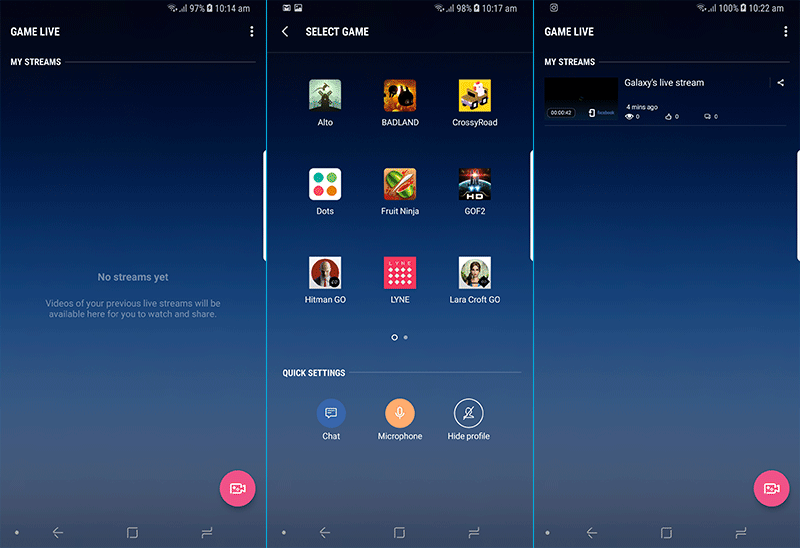 Samsung Game Live will allow users to live stream their gaming prowess to various other services. Once installed, you're able to select between Facebook, Twitch, and Youtube for live streaming gaming action. Twitter is also an option for sharing a link to your stream, as well as Facebook or via an SMS message. Other options include setting up a profile with a photo and choosing between microphone or in-game audio. Videos are capped at 4GB, or "around 200 minutes at high quality", but you will be able to stream for longer at lower resolutions. Sessions can also be saved for viewing or sharing at a later date. We know for sure that it will work on a Samsung Galaxy S8 (and likewise probably the S8+), and it looks like it will also work on older Galaxy devices running Android 6.0 Marshmallow or above (it certainly works on the S7 and S7 Edge, according to commenters). I wasn't able to get it to install on my Nexus 5X, though, so it's not likely to work on any non-Samsung phones. It's not yet available on the Play Store, but you can apparently get it through Galaxy Apps. You can also grab it manually from APKMirror. Let us know in the comments what you make of it if you do give it a try. The app is now live on the Play Store if Samsung Galaxy owners would like to give it a go. Our resident game expert Matt has tried it out. Unfortunately, he found that the quality of Twitch streaming was pretty low even when set to ultra. He also found that the app would only allow the use of his main Google account for YouTube, so if you use a separate account for gaming you won't be able to sign into it and stream with Game Live.